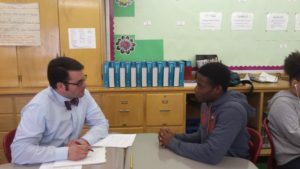 Taking part in mock employment interviews is a standard element of JAG CT activities, very often accompanied by volunteer professionals who visit the class to assist. They were in full swing last week, as New Britain High School Specialist Emily Carver and Manchester High School Specialist Justine Meyer recruited nearly a dozen volunteers in to work with their students. Volunteers got a list of interview questions ahead of time, and a rubric they used to rate students on elements such as posture, grammar, body language and completeness of their answers. “My students really enjoyed the experience and the feedback they received, and are looking forward to heading out for actual job interviews!” Emily reported. Christin a Lumbreras of Arris is pictured above, interviewing Izabella Santos of New Britain High; and Jason Scappaticci of the Manchester Board of Education interviews Solomon Reynolds, at left. Thanks to them and all of the others who volunteered their time! Hats off to N.B.H.S. JAG Graduates! New Horizons JAG student wins scholarship!